Every January, Catalonia welcomes the beginning of the ‘calçots’ season. The 'calçot' - a type of long white spring onion - is one of the most traditional foods in Catalonia, a delicacy from the winter months, eaten with its own special sauce. The city of Valls, in southern Catalonia, is the cradle of ‘calçots’ and a festival held in the city kicks off the ‘calçots’ season every year. Called the ‘Gran Festa de la Calçotada’, the festival welcomes more than 40,000 visitors every year and is one of the most important gastronomic events in Catalonia. Coming from throughout the country but also from abroad, visitors enjoyed live demonstrations on how to grill the seasonal vegetable and how to make the romesco sauce, for instance. 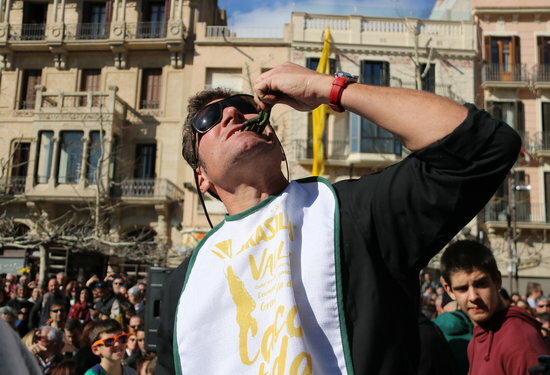 Yet, one of the most attractive activities is the ‘calçots’-eating contest. The ‘calçots’ season is in fact the peak tourist season in the county. The president of the Valls Chamber of Commerce, Rafel Castells, said that “most people like ‘calçots’, as it is a casual dining occasion with friends.” According to him, “that is the basis for success”. What’s more, this year visitors could buy a wine specially produced for the festivity, called '4 Calçots'. The ‘calçots’-eating contest is the activity that attracts more attention from visitors. People gather in a la Plaça del Pati square to see how dozens of people try to eat as many ‘calçots’ as possible in less than an hour, concretely in three quarters of an hour. The winner was Adrian Wegrzyn, from Barcelona. He not only won, he also reached a record. Wegrzyn ate 5.8 kilos of ‘calçots’ in 45 minutes, a total of 310 ‘calçots’. Indeed, Wegrzyn broke his own record, reached in 2014, when he ate 3.8 kilos, a total of 275 calçots. His father, Constantine Wegrzyn, ranked second. A 'calçot' is a type of long white spring onion cultivated in a special way. These onions are called 'calçots' because while they are growing the farmer has to 'calçar-les' -wrap the onions with soil- many times. This process gives 'calçots' their characteristic long shape. This agricultural technique was discovered at the end of the 19th century by a Valls farmer, who is said to have invented the sauce that accompanies 'calçots' and the way to cook them too. Since then, eating 'calçots' has become one of the main Catalan gastronomic - and social - traditions of the year, with families and friends gathering together every year to celebrate a ‘calçotada’, the event where 'calçots' are cooked and eaten.